That depends on whether Don—who’s had the more difficult morning—is able to manage his state of mind. 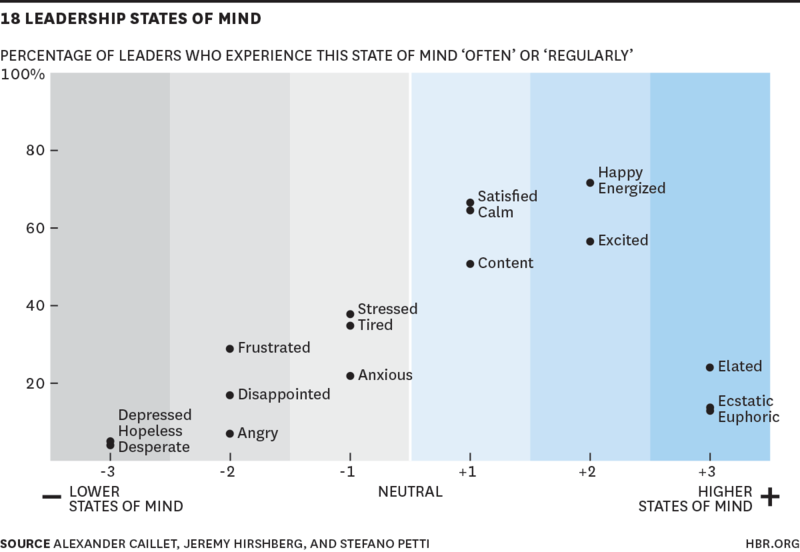 For 20 years, we’ve worked with leaders in more than 30 countries and across diverse industries to help them understand how state of mind (that is, their moment-to-moment experience of life as generated by their thinking and as expressed by their feelings) can affect their leadership, and to help them manage their respective states of mind, rather than being managed by them. The chart clearly shows that most leaders seem able to access CHE states on a regular basis. However, Frustrated, Anxious, Tired and Stressed (FATS) states of mind were also relatively common. And we found that certain factors such as age, gender, organizational level, organizational tenure, span of influence, and type/size of organization, are correlated with similar states of mind, with lower states more prevalent in certain categories of people—including the young, the male, those with less tenure, and those operating at lower organizational levels. Thoughts and feelings. Acknowledge your emotions to reduce their intensity. Allow your thoughts to be transient. Visualize positive images to generate positive feelings. Refocus your attention on different stimuli. Journal to find clarity. And engage in meaningful conversations to foster understanding and optimism. Physiology. Use deep breathing to reduce stress. Stretch to loosen muscles, stimulate blood flow and improve cognitive function. And take breaks to clear the mind, relax the prefrontal cortex and increase contentment. External environment. Adjust lighting and block noise to generate calm. Listen to music to stimulate reflection. Eliminate clutter to reduce anxiety and improve focus. And spend time in nature to shift perspective. Health and well-being. Eat a well-balanced diet, stick to an exercise regimen and get adequate sleep to maintain your energy and balance. Don did just that. Realizing the state he was in, he took stock of his anxiety, engaged in deep breathing, visualized having a positive conversation with his daughter, and accepted that he would not change the traffic. He then began to explore how he would manage his lateness and his workload. His state of mind shifted and he felt clear for the first time that day.